Data by the Department of Agriculture shows agriculture and agriculture-related industries contributed $992 billion to the U.S. gross domestic product in 2015, a 5.5-percent share, the most recent USDA statistics.The output of America’s farms contributed $136.7 billion of this sum, about one percent of GDP. USDA says the overall contribution of the agriculture sector to GDP is larger than that figure because related sectors rely on agricultural inputs like food and materials used in textile production to contribute added value to the economy. In 2015, farming’s contribution to GDP fell for the second consecutive year after reaching a high point of $189.9 billion in 2013. A major reason for the downward trend has been falling commodity prices like corn and soybeans, which peaked around 2013 and have since declined by at least 30 percent. The food service category, eating and drinking places has expanded over a similar timeframe and may be a beneficiary of the lower commodity prices at the farm level. 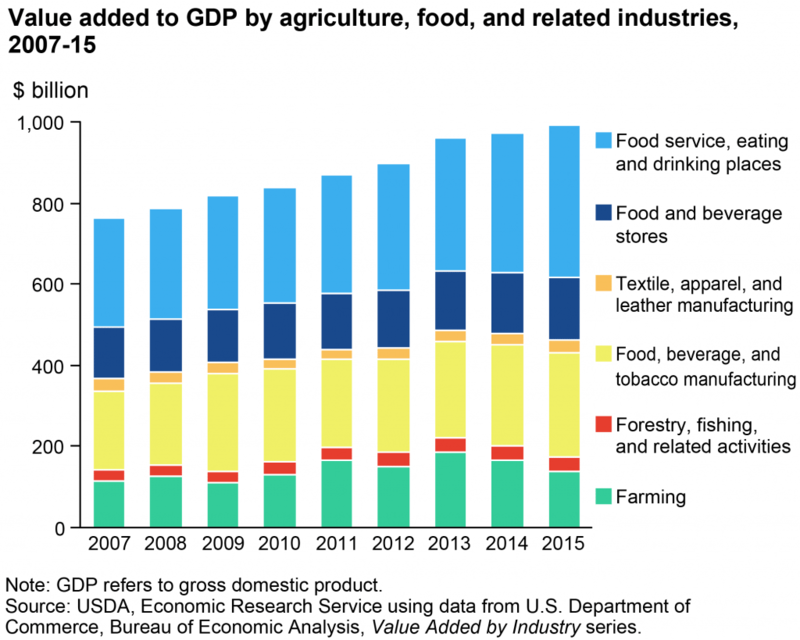 Agriculture, food, and related industries contributed $992 billion to U.S. gross domestic product (GDP) in 2015, a 5.5-percent share. The output of America’s farms contributed $136.7 billion of this sum—about 1 percent of GDP. The overall contribution of the agriculture sector to GDP is larger than this because sectors related to agriculture—forestry, fishing, and related activities; food, beverages, and tobacco products; textiles, apparel, and leather products; food and beverage stores; and food service, eating and drinking places—rely on agricultural inputs in order to contribute added value to the economy.